Canola is an important crop in North Dakota. It is grown for its oil content for food and fuel purposes. 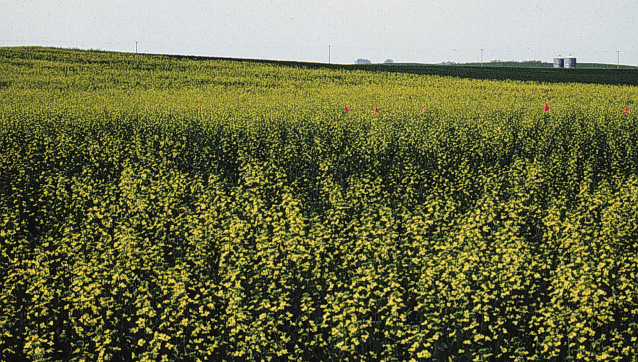 Nitrogen (N), phosphorus (P) and potassium (K) requirements of canola and mustard are similar to those of small grains. 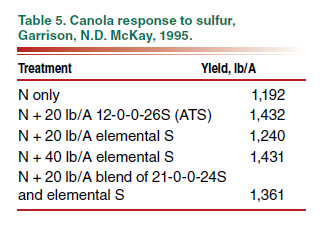 Sulfur (S) requirements for canola are higher than most crops. Soil test results direct fertilizer rates for N, P and K. Soil cores should be taken from 0 to 24 inches deep and divided into 0- to 6-inch and 6- to 24-inch samples. P and K should be analyzed on the 0- to 6-inch sample, while N should be tested on each depth. Nitrogen calibration studies have been conducted through the NDSU Langdon, North Central, Williston, Carrington and Hettinger Research Extension Centers, with additional sites near Valley City and Wishek providing data to support these recommendations. The data, which are well represented by the charts in Figure 1, show that the optimum N rate is similar for a lower-producing variety, compared with a more productive, N-efficient variety. It also indicates that the optimum N rate at lower-productivity sites within variety type is similar to the optimum N rate at higher-productivity sites. Figure 1. Return to N at Hettinger and Langdon. 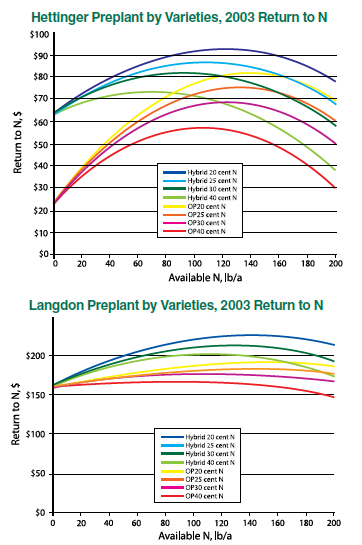 Return to N was calculated using a canola price of 10 cent/pound and the yields of the N rate study at each site in 2003. Higher canola prices only slightly shift the curves to the right. Available N is soil test nitrate to 2 feet in depth, plus any previous crop credit and supplemental N. OP is an open-pollinated variety and Hybrid is a hybrid variety. Therefore, producers do not need to adjust rates for yield goal. The same N rate to support yield in high-yielding environments is the same N rate to support yield in lower-yielding environments. 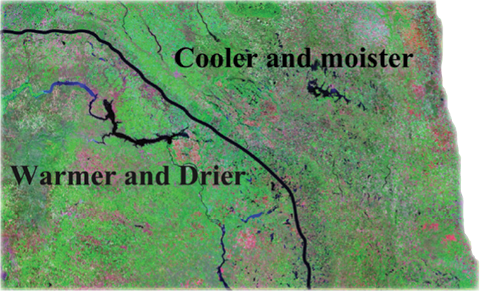 Due to yield-limiting environments in the drier, warmer areas of North Dakota and the economics of N application in the two environments, the N rate for canola production is less than that in the moister and cooler areas of North Dakota. Overapplication of N to canola led to drastic profit reduction at all of the sites. The nitrogen rate is adjusted due to the soil-test nitrate-N to 2 feet in depth, usually obtained the fall preceding canola production. 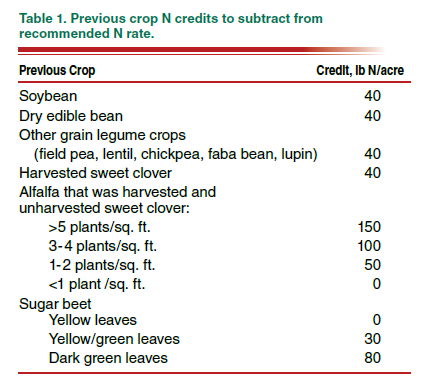 The nitrogen rate also is adjusted due to a previous crop credit, as indicated in Table 1. Half of the N credit indicated for the first year for sweet clover and alfalfa is recommended, but no N credit is recommended after the second year for other crops. Nitrogen may be fall applied on most North Dakota soils, except on sandy loam or coarser textures, or where flooding is expected in the spring. Ammonium-N sources, including anhydrous ammonia and urea, should be used for fall application, and not fertilizers such as urea/ammonium nitrate solutions that contain nitrate. No fertilizer N application is recommended before Oct. 1, with application of ammonia delayed until the soil temperature, measured at the 4-inch depth between 6 and 8 a.m., falls to 50 F. Banded urea should be delayed a week later than the ammonia application date, and broadcast urea should be delayed two weeks later than the ammonia application date. A nitrapyrin or DCD nitrification inhibitor, applied at a proper rate, will help slow the nitrification process, but these materials should not be used for earlier than recommended application, but to protect ammonium-N from being transformed to nitrate in fall seasons with delayed soil freeze-up. Spring application may be made preplant or at planting. Canola is very sensitive to fertilizer salts. No more than 5 pounds/acre (lb/A) of N + K2O should be placed with the seed in 12-inch row spacing for medium-textured soils, but the rate can be increased proportionally with narrow row spacing or increase in seed spread (Table 3). P and K recommendations are shown in Table 2. Canola and mustard are good scavengers of P and have a very strong need for concentrated row-starter. A row-starter fertilizer rate of 30 lb P2O5/A is sufficient to achieve higher yields at medium soil test levels unless you plan additional buildup P rates. On coarser-textured soils, where no nitrogen is recommended, 11-52-0 (MAP) would be a better seed-placed choice of phosphate because its nitrogen component is not as likely to injure seed as 18-46-0 (DAP). Potassium, if needed, may be added to row starter if the final N + K2O is 10 lb/A or less, using a double disc opener with 12-inch row spacing (Table 3). Broadcast P and K are acceptable. However, some P as a row starter is very important. Canola has special requirements for sulfur, while mustard does not. A 2,000-lb/A canola crop contains about 12 lb S/A in the straw and 15 lb S/A in the seed. A 2,400-lb/acre wheat crop, on the other hand, contains only 5 lb/A S in the seed and 7 lb/A in the straw. The consequences of low soil S levels are very serious in canola production. Low sulfur can make the difference between having a crop and not having a crop, as shown in Table 4. 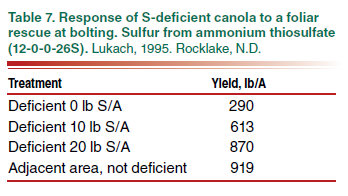 Canola responses to sulfur have been demonstrated frequently in North Dakota (Table 5). No soil test procedure has been shown to be diagnostic in the world. 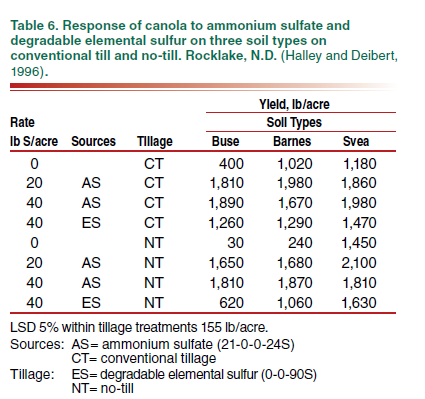 The current S soil test tends to overestimate available sulfate-S, and field variability is huge, as shown in Figure 3. Therefore, regardless of soil test analysis, dry or wet season, coarse or higher soil texture, 20 to 30 lb/A of S as a sulfate or thiosulfate form is recommended. Figure 3. Sulfate-S soil levels from a square, 40-acre area sampled in a 110-foot grid, Valley City, N.D, 1995. Levels vary from 4 lb/A 2 feet to 580 lb/A 2 feet. Canola takes up sulfate-S. The form of sulfur fertilizer may be ammonium sulfate (21-0-0-24S) or another available sulfate fertilizer, such as ammonium thiosulfate, potassium thiosulfate and other sources. We do not recommend elemental sulfur because it breaks down slowly to sulfate-S.
An example of the effectiveness of ammonium sulfate, compared with elemental sulfur, is shown in Table 6. For this reason, supported by additional research in North Dakota and Canada, we do not recommend elemental sulfur alone or in a blend unless the blend contains sufficient available sulfate to make a crop on its own. Gypsum (calcium sulfate) generally is not recommended because it has relatively low solubility, compared with ammonium sulfate, and because most gypsum commercially available is in forms that are not as easy to handle and spread as ammonium sulfate or elemental sulfur. If gypsum pellets were available with acceptable spreading qualities and rates were increased somewhat to compensate for lower solubility, gypsum application would be acceptable. A variety of sulfur deficiency symptoms are shown in Figures 4 through 6. Deficiencies often are seen on higher landscapes (hilltops and slopes) where soils are coarser or eroded and organic matter levels are lower. Early season symptoms are yellowing between the leaf veins, cupped leaves and stunting. Later in the season, leaves are cupped, slender and purple, especially at the edges and on the bracts. Flowering is delayed and flowers may be pale yellow or white when they emerge. Deficient areas may have a bronze appearance from a distance. Seed often does not set and pods will be barren or poorly developed. 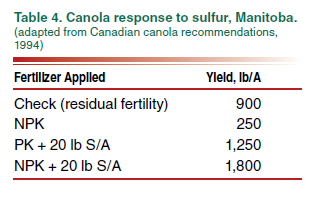 Producers must seriously consider sulfur nutrition in a canola fertility program. Providing adequate sulfur before or at planting is best. However, if deficiencies are identified early in the season before significant flowering, yield responses still are possible by applying a rescue treatment of ammonium thiosulfate (12-0-0-26S) or ammonium sulfate (Table 7). The earlier a treatment is made, the greater the yield response. Leaves absorb little sulfur. A rescue treatment needs rainfall to move the soluble sulfate to the roots. 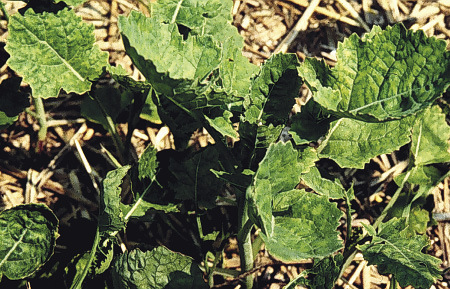 A top-dressed treatment also may be the best alternative to sulfur application on dormant seeded canola. Fall application places available sulfur at risk for spring leaching. In a dry spring, this may not be a problem, but in wet springs, leaching can place the sulfur below the rooting zone. Top-dressing when canola is small reduces the risk of spring losses. Dry sulfate materials do not volatilize and remain available, providing rainfall incorporates the application. Top-dressing with liquids should wait until after the fifth leaf emerges and leaves become sufficiently waxy to minimize leaf burn potential. Following the canola harvest, cut canola stems may continue to bud and regrow into small plants if they are deficient in sulfur. Plants that received adequate sulfur during the growing season will not branch and regrow in this way, but will be dead stubble following harvest. The unfortunate producer may use this delayed senescence resulting from sulfur deficiency to advantage as a map of deficient areas in future years. Do not confuse this type of regrowth with volunteer seed sprouting following harvest. 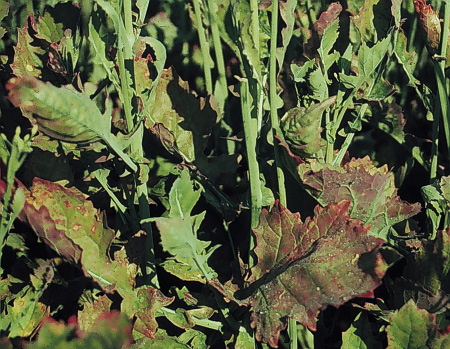 Although some published reports indicate micronutrient deficiencies are possible, canola and mustard have not been shown to exhibit any micronutrient deficiency, including zinc, boron or copper, in North Dakota. Halley, S. and E.J. Deibert. 1996. 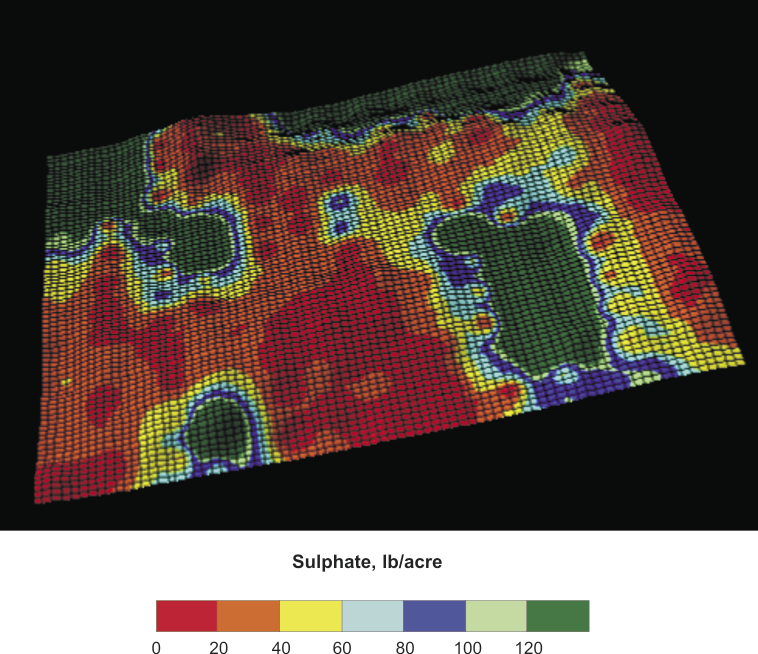 Canola response to sulfur fertilizer applications under different tillage and landscape position. 1996 Annual Report to USDA-CSREES Special Programs, Northern Region Canola and North Dakota Oilseed Council. North Dakota State University Fargo, N.D. This publication was originally authored by D.W. Franzen, NDSU Extension soil science specialist, and J. Lukach, a former researcher at the NDSU Langdon Research Extension Center, 2007.